Stunning 14k white gold trinity knot pendant set with three emeralds. Handmade and hallmarked in Dublin. 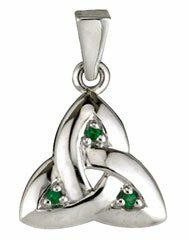 Beautifully detailed Celtic trinity knot pendant handcrafted in 14k white gold and set with three real emeralds. Measuring 13mm wide and 18mm high, this Celtic pendant is guaranteed Irish and hallmarked at the Irish Assay Office in Dublin Castle. The pedant is fitted with a white gold 18 inch chain and is boxed in an elegant presentation.